In Appalachia, it is not uncommon to see the effects that mountaintop removal mining have on the surrounding ecosystems. 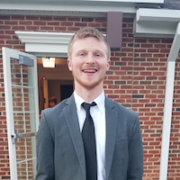 As someone living in the great Mountain State of West Virginia, one of the projects that caught my interest when I started my internship at SkyTruth was their work mapping the extent of surface mines in central Appalachia. There are many risks that come with this type of mining. Lung cancer, kidney disease, and birth defects are more likely in areas with high exposure to the toxins produced by mountaintop mining. There are currently no government funded long-term health studies in progress. The last one, started during the Obama administration, was shut down in August 2017. SkyTruth has been using the Normalized Difference Vegetation Index (NDVI) to detect surface mines. 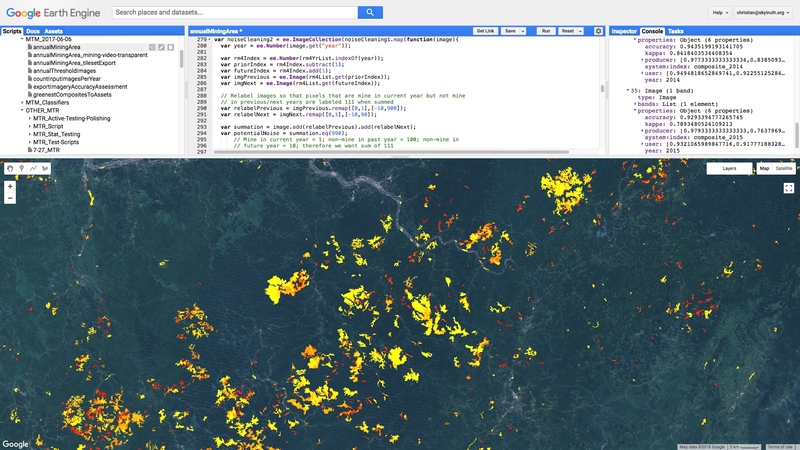 Basically, this algorithm measures vegetation intensity over an area. 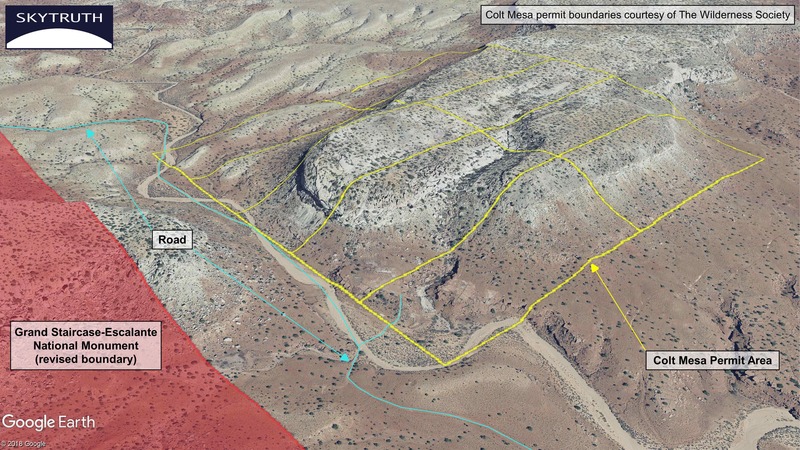 So, areas with low NDVI scores – or low vegetation levels – show up as mines. Seems simple enough. But the challenge to using NDVI to detect surface mines is that roads, parking lots, lakes, and buildings also have very low levels of vegetation, so they can confuse the algorithm into believing that they’re actually mines. 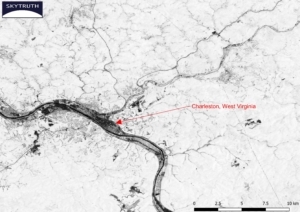 The two NDVI images below – one showing Charleston, West Virginia, and another showing a surface mine in central Appalachia – show how difficult it can be for the algorithm to tell things apart. NDVI image of Charleston, WV. 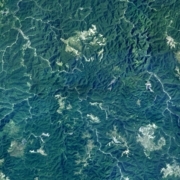 NDVI image of surface mines in central Appalachia. Both of these images show areas with low NDVI scores (or low vegetation intensity). Low NDVI scores are indicated by the darker shades in each of the images. The areas that have a high NDVI score are colored in lighter/whiter shades. Using these images as an example, it’s easy to see how the algorithm that we’re using can get confused. Since things can look alike, we needed to figure out a way to help the algorithm determine which things were roads and buildings and which things were actually mines. SkyTruth’s surface mine mapping work relies on the use of a data mask to separate out the region’s urban areas, water features, and roads. The mask is used to block out areas from the analysis which have a similar spectral signature to mines (basically roads, buildings, water, parking lots, etc.). Since the surface mine mapping project is updated annually, the mask needs to be updated annually, too. First, I downloaded the area files, which are provided by US Census Bureau, and then I buffered the roads and water features by 60 meters. The buffer is to ensure that these areas are not picked up by the algorithm. 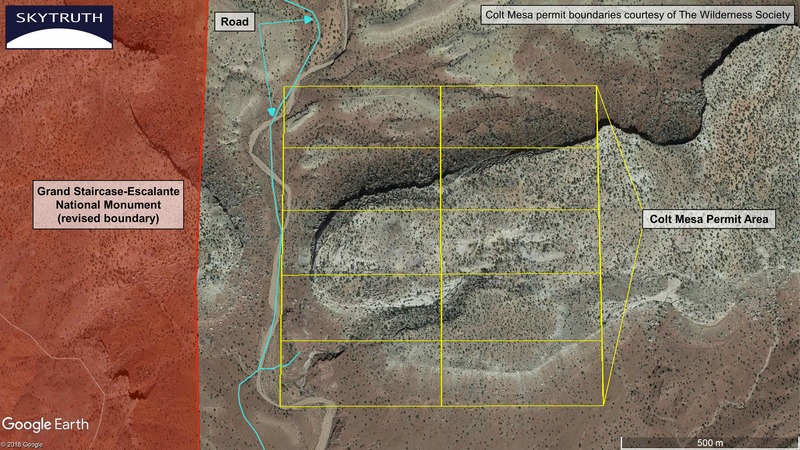 The image below shows the mask that will cover the features that have a low vegetation index that could potentially be incorrectly identified as a surface mine. 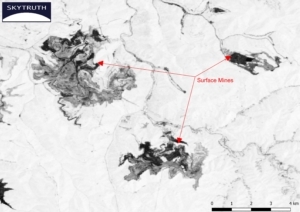 NDVI image of SkyTruth’s mountaintop mining study area with roads, water, and urban areas masked. This next image shows how the mask covers an area like Charleston, West Virginia and blocks the algorithm from detecting it as a surface mine. The other features in the image that have low vegetation intensity – like potential mines – are still visible as darkly areas in the image. NDVI image of Charleston, West Virginia with the mask applied. SkyTruth, Appalachian Voices, and scholars at Duke University recently published the first-ever annual footprints of mountaintop mining in central Appalachia between 1985 and 2015. You can learn more about it from SkyTruth’s lead author, Christian Thomas, or you can read the whole paper in PLOS ONE. The updated map will give SkyTruth, Appalachian Voices, and scholars at Duke University, the most current information about the footprint of surface mining in Appalachia, and it will allow them to update their annual footprints with 2016 and 2017. I hope that this map will help inform the public about where surface mines in Appalachia are located, and that it will show people just how much of the Appalachian region is affected. 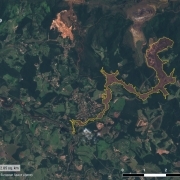 Today at 2:00 pm EST, the Open Access journal PLOS ONE published “Mapping the yearly extent of surface coal mining in Central Appalachia using Landsat and Google Earth Engine”. This paper, the product of a partnership between researchers at SkyTruth, Duke, and Appalachian Voices, provides the first comprehensive map of annual surface coal mining extent in Central Appalachia. Mountaintop removal coal mining (MTM) is an immensely damaging practice which involves removing rock and soil which overlay coal seams using a combination of explosives and heavy machinery. The removed material is often deposited into valleys, in a practice known as valley fill. Mountaintop removal coal mining is responsible for disturbing thousands of square kilometers of land in Central Appalachia and is the region’s single largest source of land use change. 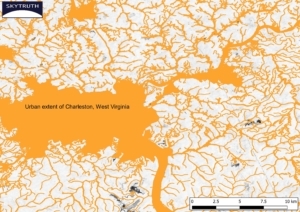 This animation shows the expansion of surface mining’s footprint (displayed in yellow) from 1985 to 2015 for a 31,000 square kilometer sub-region of the study area in West Virginia and Kentucky, and has county boundaries visible. In addition to substantial disturbances directly visible on the surface of the land, MTM and subsequent valley fills have been shown to adversely impact stream health as seen by decreases in salamander abundance and aquatic macroinvertebrate diversity. MTM has also been associated with risks to public health in nearby communities, including higher rates of cancer and heart disease. This study, published today, improves upon earlier SkyTruth work, and creates the first ever dataset of yearly active mining in Central Appalachia. Between 1985 and 2015 our study finds that 2,900 square kilometers (~720,000 acres) of this typically forested region has been cleared as a result of MTM. Coupling our results with our earlier work which dates back to 1976 we find that 5,900 square kilometers (~1.5 million acres) of Central Appalachian forest has been cleared. This is an area 18% larger than the state of Delaware, and roughly 3 times larger than the Great Smoky Mountains National Park. This image shows a snippet of code used to create the annual mining footprint data, which is visualized in the bottom section of the image. Older mining in this visual is red; newer mining is yellow. In addition to determining the spatial extent of MTM in Central Appalachia, the study also examined the relationship between the area of land being mined to coal production as reported to the United States Mine Health and Safety Administration (MSHA). Over the course of this study period (1985-2015) we see a threefold increase in the amount of land cleared to extract an identical quantity of coal (from 10 square meters of land per metric ton in in the 1980’s to 30 square meters in 2015). This dataset is freely available for the public to download, visualize, and analyze the footprint of mining in Central Appalachia. To access all the data, please visit: https://www.skytruth.org/mtr-data-files/. 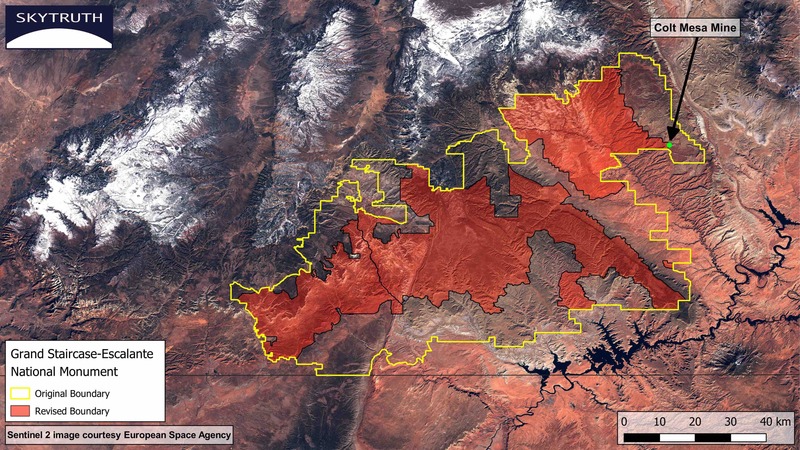 To explore a subset of the data via an interactive web map, please visit: http://skytruthmtr.appspot.com/. After our discovery of what appeared to be a significant amount of mining taking place outside the permit boundaries provided by the West Virginia Department of Environmental Protection (WVDEP), we did a little digging to try and get a better idea of what exactly happened. With the help of colleagues at Appalachian Voices, we found that a Notice of Violation (NOV) was issued for the Taywood West mine on February 22, 2018 (see the NOV here), for a sediment violation on the southern side of the mine. After some additional investigation, Appalachian Voices found that the Taywood West mine has had two boundary revisions over the course of its lifetime. One of these revisions accounted for ~35 acres of the disturbed area we previously wrote about. 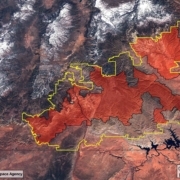 This map shows the Taywood West Surface Mine permit boundary, shaded in red and yellow, and the area added to the existing permit in orange. It is not clear why this permit boundary revision has not yet been included in the official mine permits database provided by WVDEP. 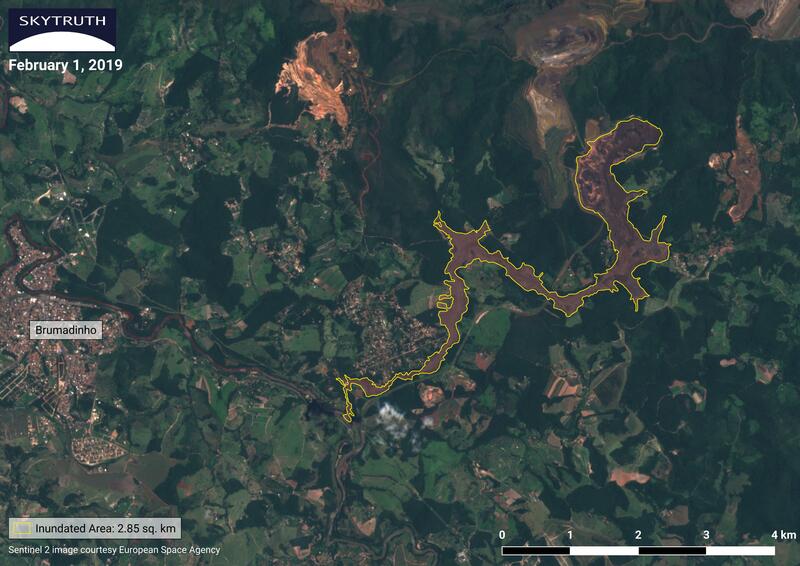 But this example serves to highlight that — in addition to enabling scientific research — our mine footprint map can be used in a monitoring capacity as well, by anyone interested in watchdogging this mining activity. 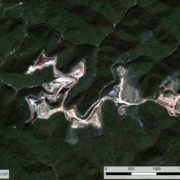 You can view our surface mining data here.